I am exceptionally lucky to have met my partner, James, but I am also incredibly lucky that, as part of the package of falling in love with this great guy, I get to spend occasional time with his terrific folks. Down-to-earth, witty, loving, and considerate, it’s no wonder great parents like them produced such a lovable kid. On a recent visit, Nancy showed me a new addition to her cookbook collection: Chloe Coscarelli’s Chloe’s Kitchen. Don’t know who Chloe Coscarelli is? Neither did I, but apparently she took the top prize on the Food Network’s Cupcake Wars. Her stuff is all vegan, thus her success on a Food Network reality cooking competition has allowed her to leap-frog other established divas of the vegan cookbook scene. Okay, I wasn’t exactly being fair-minded when I first started looking at the book. Cookbooks from TV stars tend to disappoint. Either the recipes are fairly simplistic dishes with exotic touches (usually hard to find or rare ingredients) or they’re extraordinarily complicated (more complicated than I suspect they even have to be). There’s also an incredibly annoying tendency to put the persona of the chef before the food itself – so instead of mouth-watering photographs of dishes you can’t wait to recreate, there are irritating shots of the smiling, doe-eyed cook laughing with friends, holding a cupcake or cookie, or standing near food that one presumes she has just whipped up, in between photo shoots and loving life. BUT I am always willing to overcome my prejudices to try out a promising recipe. Having long searched for an appropriate vegan replacement for my favorite meatloaf recipe, Chloe’s tempeh loaf recipe was too tempting not to attempt. I’m a fan of the policy that one good recipe can make a cookbook worthwhile. If that policy holds, then Chloe’s Kitchen should be on every vegan’s cookbook shelf, based off that tempeh meatloaf alone. The result was so delicious, it warranted another round with the cookbook. Because Chloe is first and foremost known as a vegan baker, I decided to give one of her desserts a try. I changed some of the proportions on this cookie recipe. Most notably, I was not able to easily locate instant espresso powder, so I used instant coffee instead. 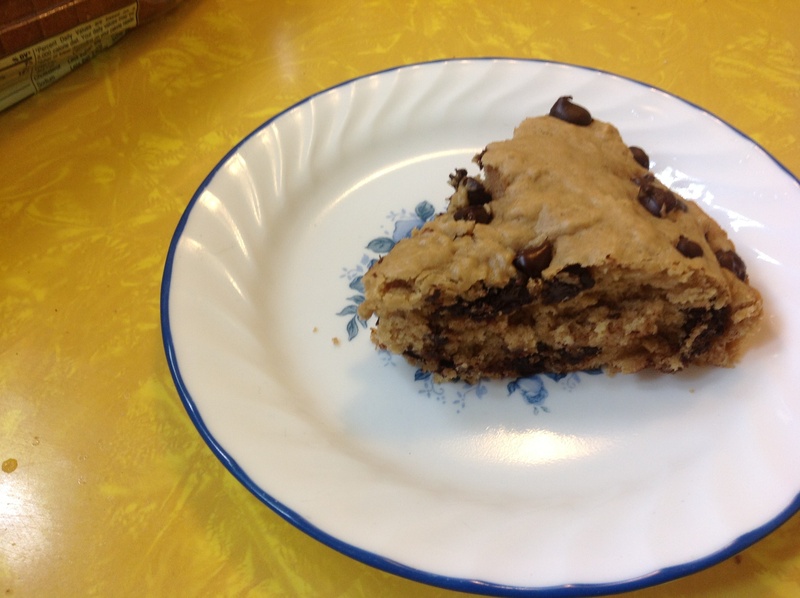 It worked just as well and added a little extra buzz to a sugar-packed, delicious cookie. Plus, when a baked good has coffee in it, you can practically call it breakfast. At least I did. – Whisk together flour, baking powder, cinnamon, and salt. Set aside. – Using a mixer, beat together margarine and instant coffee until well combined, then add powdered and brown sugars. Beat until blended thoroughly. Mix in flour mixture 1/2 cup at a time. – Stir in chocolate chips. 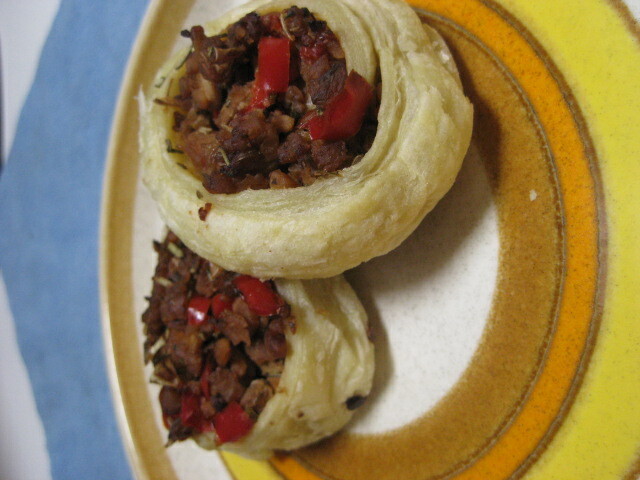 – Scoop dough by the tablespoon and roll into semi-round disks. Roll each disk in granulated sugar. Place on baking sheet 2-3 inches apart. 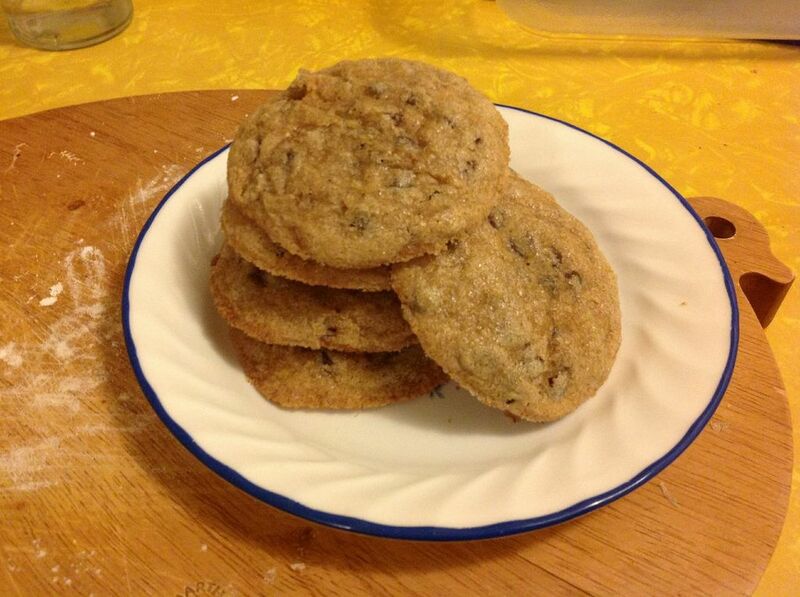 – Bake cookies about 12-14 minutes or until edges are browned. Because of the move and a whole world of personal business, we opted out of last week’s CSA package. 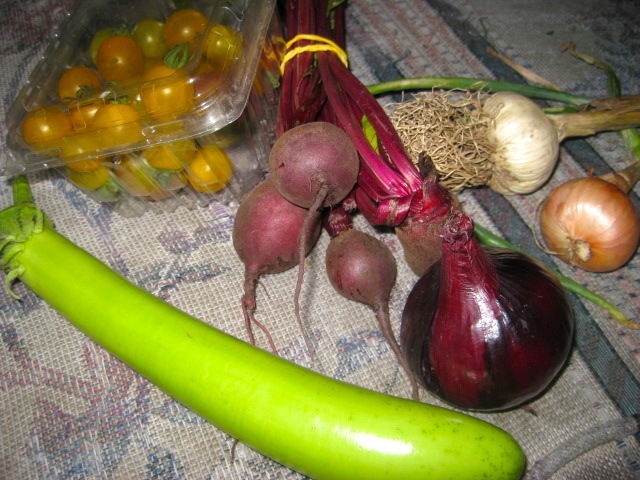 One of the best aspects of subscribing to the Garfield Community Farm is that if you can’t make a pick up, all you have to do is let them know and they will donate your share to someone in the Garfield community that could use the fresh produce. So we didn’t have to waste anything and someone got to eat some delicious farm fresh vegetables. Feels like we really didn’t miss out on anything at all. Still, I missed my weekly visit to the farm and was glad to head over there again this week, where apparently fortune smiled on our previous week’s action and delivered unto us a bounty upon which we had not yet experienced. Carrots, squash, peppers, onions, garlic, beautiful tomatoes, oh my! 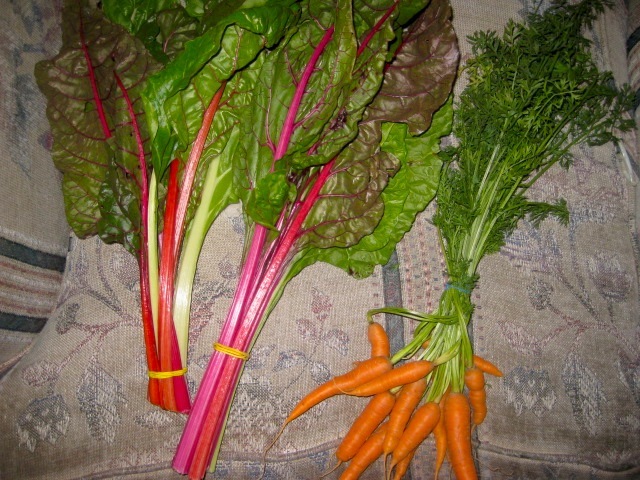 And making another appearance is the current star player of our weekly subscription, Swiss chard. Swiss chard has many names – silverbeet, perpetual spinach, spinach beet, crab beet, bright lights, seakale beet, mangold – and even more uses. Because it shares a mild bitterness with kale and collards but cooks down easily like spinach, it’s one of the most useful greens to have in your kitchen. It works in salads and soups and pasta dishes. It can work for any meal time. It’s great raw, it’s great cooked. Versatile and easy to work with, Swiss chard is also a looker. Its ruby-red stems can be cooked along with the leafy greens, so long as you snip off the really woody part toward the end. And did I mention its nutritional properties yet? This green wonder is rich with Vitamins A, K, and C, dietary fiber and minerals. Before the CSA, I used chard from time to time, but now it’s become a staple of my fridge. 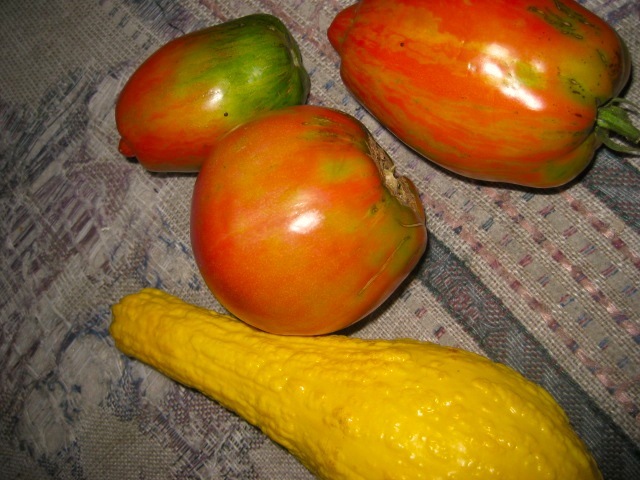 If and when I start my own garden next year, I plan on making it one of my major crops, if only so I can keep my personal supply robust and ever-present. 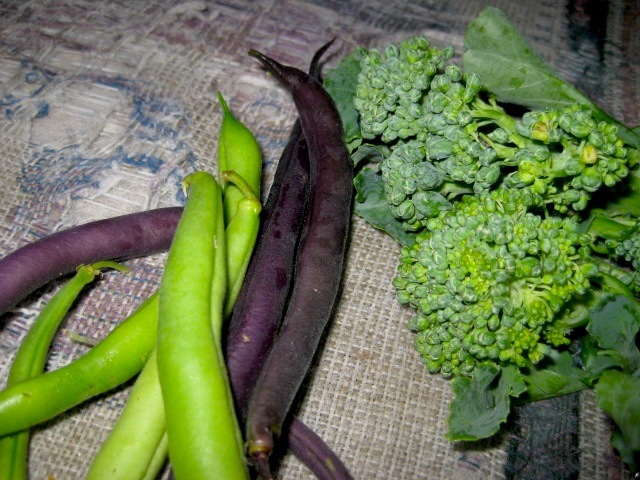 Green and purple beans, broccoli. This week was so chard-centered that I made the following recipe (from Isa Chandra Moskowitz’s indispensable cookbook Vegan Brunch) twice. – Pre-heat oven to 400 degrees. Lightly grease an 8-inch pie plate. – Saute the onions in the oil until slightly tender, about a two minutes. Add garlic and continue cooking until the garlic is golden brown. Add the chard, basil, and parsley and cook until the chard is completely soft. – Crumble tofu into a separate bowl, then add soy sauce, mustard, turmeric, black pepper, and nutritional yeast. Mix well, then add the chard mixture. Toss until well combined. 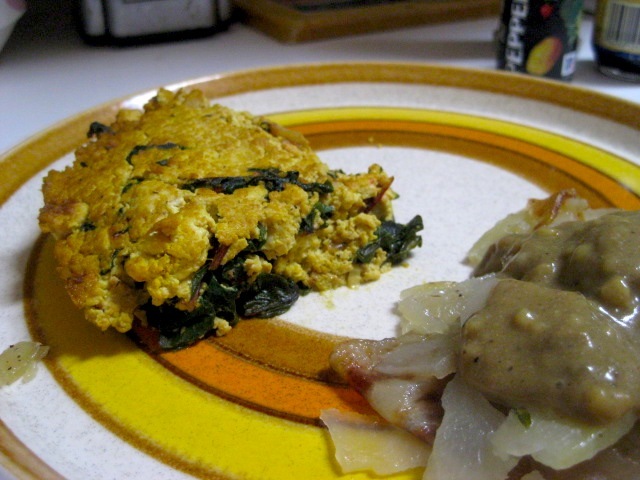 – Firmly press tofu-chard mix into the pie plate. Bake for 20 minutes, until the frittata is firm and golden brown on top. Allow to cool before serving. First off, apologies for the nearly week-long delay in posts. The past week was filled with moving boxes from Point A to Point B, then racing back to Point A to spend seven hours cleaning, then racing back to Point B to get enough unpacked so that I wouldn’t be living purely out of suitcases, then back to Point A to say goodbye to some very important people who are forgoing Point A and Point B and are, in fact, moving away from these Points completely. So of course, I had to return to Point B, my adopted home, to cry. The traditional Po’ boy is very simple: A cut of baguette-like Louisiana French bread is layered with fried seafood or some kind of roasted meat. Lettuce, tomato, mayo, and possibly onions and pickles are added. Nothing crazy, right? It’s a sandwich like most sandwiches in that includes meat, toppings, and is sandwiched between preferably good quality bread. But like many sandwiches, it has earned a vaulted place among sandwiches. We have New Orleans to thank. According to the Wikipedia entry, Po’ boy shops are the most basic of restaurants, the very simplest being a counter in which the sandwiches are wrapped and sold with little to no cooking done on the premises. Things progress from there, with the sandwiches being prepared and served in establishments of both low and high calibers. Once fancy restaurants started picking up the beloved dish, it was only a matter of time before it spread to other regions, only this time the trickle was downward, from high to low, instead of from counter and gas station upward. So it is with regional wonders: What is a significant part of one community is a novelty item in another community. To me, you can’t have a Po’ boy without the pickles and the French bread, but when it comes to the meat filling, the options are a bit more open. 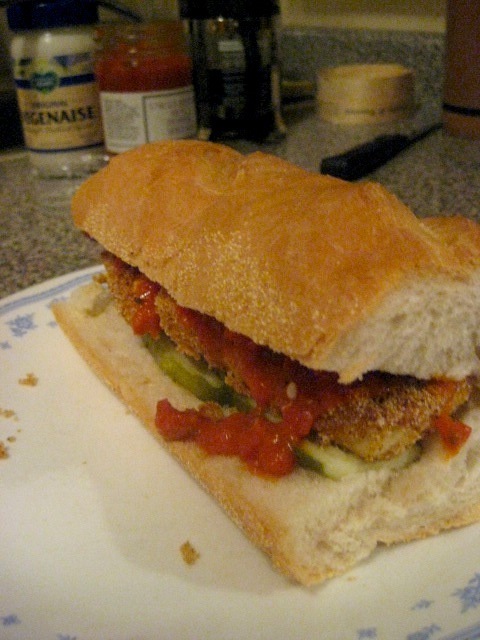 When I was thinking of trying a vegan Po’ boy recipe, I considered several ideas for the filling, but I settled on tofu, as it takes to a fried cornmeal breading extremely well, while retaining a tender internal flakiness not unlike catfish. I took a few cues from Veganomicon‘s “Chile and Lime Cornmeal Crusted Tofu” but this was mostly riffing with the items I had on hand. I like my To’ Boy on the spicier side, but play around with the proportions of your spices so that you find a good balance for you. Also, this sandwich ends up being a bit tall, so prepare your mouth for large bites. – Uncle Fester’s Hot Pepper Spread – Optional, but we used it as an added sauce on the sandwich and it worked great, not too hot, a little sweet. If you want something a bit more standard, opt for a simple tomato or marinara sauce. – In a wide, shallow bowl, mix cornmeal with baking powder, lime juice, and spices. Set aside. – Dip each tofu slice into the non-dairy milk, then dredge through the cornmeal mixture, coating each side evenly. Coated pieces can be set aside. 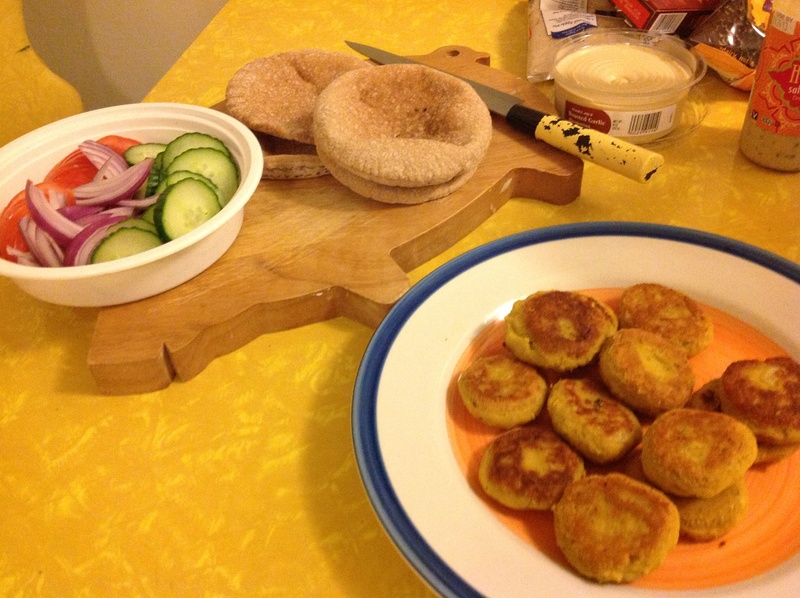 – Fry your tofu until each side is golden brown. Allow fried tofu slices to cool and drain. – On each third of baguette, slather one side with vegan mayo, then layer: Pickles on the bottom, tofu slices, sauce (if using). Add some lettuce for added green value. Close up your sandwich and enjoy! After a quick three-day jaunt out of town, I am back in Pittsburgh to finish what I really started last week: Moving out of my lovely apartment in the loveliest lil’ borough of Dormont. I packed up the books (Eighteen boxes! Not counting the cookbooks! ), then the movies, then the records, which meant, of course, that I’d have to eventually get around to packing up my kitchen. Which I’m still in the process of doing. I spent nearly all day in and out of the kitchen, wrapping up glasses and plates in newspaper, stuffing boxes full of random utensils, stripping off the worn and dingy shelf paper, finding the right box to hold all of my spices and baking accessories. In one little kitchen there seems to be so much that needs to be done. You have to wonder how it only took two years to pack this much intricacies into a room. It feels like there’s something in every corner. Tomorrow movers come in to transport my beloved yellow kitchen table (known as “Goldie”) and chairs to its new home in Shadyside, where the affluent and intellectual will surely sense that I do not match the delicate inner workings of the neighborhood and reject me, sending me right back into the arms of the South Hills. It’s not that I’m not looking forward to trying out Shadyside. I sort of lived in that area while in my undergraduate years at Chatham, but I always stuck to the Squirrel Hill side of the campus. I know of good places to go, but mostly specialty spots, places that I wouldn’t necessarily visit on a regular basis. I need the rundown on the staples. While I attack the rest of my apartment, I ask you affluent, intellectual types out there: What is there to do in Shadyside? Best coffee shop? Best restaurant? Best place to grab a cheap lunch? Any suggestions?